I remember getting a call from the, uh, fire department commander, telling me that they were not sure they were gonna be able to contain the fire, and I said, "You know, we've had such terrible loss of life, maybe the smartest thing to do is, is pull it. And they made that decision to pull and then we watched the building collapse. Also http://VestigialConscience.com/PullIt2.mp3 in which the word "pull" is used to describe a controlled demolition. Thanks to Sir Dave 'tmo' Soule for posting these audio files. Jeff King has posted a wonderful, up-to-date summary, entitled "The World Trade Center Collapse: How Strong Is The Evidence For Controlled Demolition?" This article is definitely the place to start reading about these issues. The key fact is that a video of the South Tower collapse clearly shows flashes of light at very high color temperature, the signature of explosive cutting charges, immediately preceding otherwise inexplicable collapses of key structural members. Another key reference is this 2-part series by J. McMichael, "Muslims Suspend the Laws of Physics". 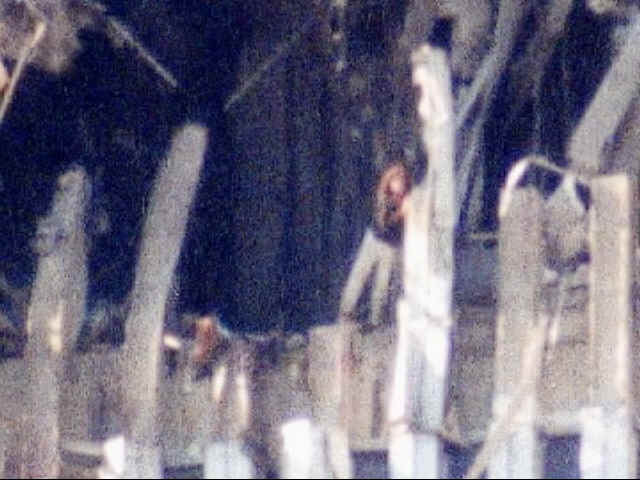 McMichael argues that the fires at the WTC were not hot enough to have substantially weakened the steel structure. This argument is also strongly suggested by the image below (from Eric Hufschmid's video "Painful Deceptions") which shows a woman looking out from the hole in the North Tower. Cool temperatures in the collision zone were also confirmed by an audiotape indicating that firefighters reached the area of the crash damage in the South Tower, and reported survivable temperatures there. Relatively hot conditions may have existed in smoldering fires higher in the towers, but would not have created synergistic effects with the collision damage to create an overall weakened condition sufficient to create a collapse. A study by Paul J. Lioy et al. examined three samples of dust deposited by the WTC disaster, and found that the samples consisted of a homogeneous mixture, primarily made of cement and soot (37 to 50%), glass fiber (40%) and cellulose (9 to 20%). The proportion of particle sizes from 75 to 300 microns in diameter ranged from 42% to 46%, while particles less than 75 microns in diameter made up 30 to 39 percent of the samples. This dust was deposited around Manhattan in tremendous quantities (up to 10 cm thick at distances of 700 meters from the collapse site), consistent with the idea that most of the concrete, drywall and fireproofing in the buildings ended up as dust. Creation of such a finely ground and homogeneously mixed debris is difficult to explain as the result of a mechanical pounding process, but could be explained by highly turbulent combustion effects at high temperatures -- at least hot enough to cause spalling of the concrete due to explosive evaporation of entrapped water. An analysis by Jim Hoffman argues that pyroclastic flows such as the WTC dust cloud must expand primarily by thermal heating. He reduced the calculated expansion volume by 33%, to account for turbulent mixing with surrounding air. Hoffman shows that even after this correction, the pyroclastic flow from the North Tower collapse expanded to approximately three times the original volume of the tower. According to Hoffman, this expansion is due to either heating of the air mass within the towers, or boiling of the water contents of the concrete. However, http://www.controlled-demolition.com/images/client/kingdome.mpg shows that the Kingdome demolition also generated a vast dust cloud, although only ordinary demolition charges were used. I've undertaken a preliminary and inconclusive photogrammetric analysis of the Kingdome demolition here. Hoffman's analysis neglects the possibility of accelerated combustion of the flammable contents of the WTC during the collapses. Any such combustion would have been limited by the available volume of oxygen, as well as other factors. Here is a preliminary analysis (Caveat lecteur: this has not been through peer review!) Using an air density of 1.22 kg per cubic meter, and an estimated volume of air 1.5e6 cubic meters, the mass of air in each tower would be 1.9e6 kg. Given a stoichiometric ratio of 15 kg of air for each 1 kg of fuel, we could burn 138 tons of fuel with the air in each building. If the energy content of the contents is 10 gigajoules/ton, we would obtain 1380 gigajoules of energy, or 380,000 kwh. This is probably an upper limit on the energy that could have been released by accelerated combustion, although the actual figure may have been much lower. Also note that any accelerated combustion would have released large volumes of CO2 and H2O, which would contribute to the expansion of the pyroclastic cloud. From the FEMA report, for the floors of each WTC tower, we have ~40,000 sq ft of floor area (including the core) * 117 floors * 4" thick of "lightweight" concrete (5" in the core), which works out to about 58,000 cubic yards. "Normal" concrete ways about 2 tons per cubic yard, but "light weight" concrete can be anywhere from about 600 to 3000 pounds per cubic yard. If we take a figure towards the high end of the range, we would estimate about 90,000 tons of concrete, but the correct figure could be much lower. Additionally, all of the exterior columns (and presumably core columns and spandrel plates as well) were coated with several inches of a fireproofing plaster containing either asbestos or "inorganic fibers" which presumably might include fiberglass. From the Guardian, the exterior columns were about 13" square (240 columns) and the core columns were about 14"x36" (48 columns) so the surface area of all the columns would be 17280 square feet per floor, or 2 million square feet for the entire building. Covering with a 3" layer of fireproof plaster would require 19,000 cubic yards, which could easily amount to another 10,000 or 20,000 tons of fiberglass-rich material. Overall, the mass of concrete and fibrous material in each WTC tower is probably not more than 110,000 tons. This revised estimate was used in Hoffman's later revisions of his paper. When all is said and done, I believe that the analysis by Jim Hoffman is substantially correct -- the energy required to heat this huge mass sufficiently to reduce it to powder is very difficult to account for by any reasonable combination of gravitational and combustion effects, without the input of additional energy from explosives. On the other hand, I do not see any conclusive evidence of extremely high energy inputs from advanced technologies. The key documents are the Partin report, the Elgin blast study, and the early media reports of multiple explosive blasts. Also, here is a book-length discussion, "The Oklahoma City Bombing and the Politics of Terror" by David Hoffman, hosted on-line by the Constitution Society. "It had to have been mined," said the gruff, gnarly voice on the other end of the line. "It's real simple. You cannot bring down a building like that without cutting charges set on the support pillars." Bud, an ex-Green Beret who saw heavy combat in Vietnam, should know what he's talking about. Bud had military demolitions training — the kind taught to men who need to know how to blow up hardened targets. "It couldn't have been done externally like that," added Bud. "Without cutting charges, there's just no way to do it." Bud didn't want me to use his full name. He was worried about his VA benefits. One man who wasn't worried about government reprisals was General Benton K. Partin. A retired U.S. Air Force Brigadier General, Partin had responsibility for the design and testing of almost every non-nuclear weapon device used in the Air Force, including precision-guided weapons designed to destroy hardened targets like the Alfred P. Murrah Building. Partin has exhaustively researched the bombing and the resulting pattern of damage. When I first saw the pictures of the truck-bomb's asymmetrical damage to the Federal Building, my immediate reaction was that the pattern of damage would have been technically impossible without supplementing demolition charges at some of the reinforcing concrete column bases…. For a simplistic blast truck-bomb, of the size and composition reported, to be able to reach out on the order of 60 feet and collapse a reinforced column base the size of column A-7 is beyond credulity. The full text of Partin's report, reproduced in the appendix, is too complex to elaborate on here, says a truck filled with ammonium nitrate could not have caused the degree of damage done to the Alfred P. Murrah building. Not when it was parked at least 20 feet away from that building. Without direct contact, the fall-off from the blast would be too great to do any serious structural damage. Another man who knows a thing or two about bombs is Samuel Cohen, inventor of the Neutron Bomb. Cohen began his career on the Manhattan Project at Los Alamos, where he was charged with studying the effects of the atomic bombs that destroyed Hiroshima and Nagasaki. During his 40 year career, Cohen worked with every application of nuclear weapons design and testing. It would have been absolutely impossible and against the laws of nature for a truck full of fertilizer and fuel oil… no matter how much was used… to bring the building down. Interestingly, the Ryder truck-bomb has earned the nickname the "Mannlicher-Carcanno Bomb" after the cheap Italian-made rifle with a defective scope that was allegedly used to kill President Kennedy. District Attorney Jim Garrison joked during the Shaw conspiracy trial that the government's nuclear physics lab could explain how a single bullet could travel through President Kennedy and Governor Connally five times while making several u-turns, then land in pristine condition on the President's gurney. In the Oklahoma bombing case, it appears the government is attempting to perform a similar feat of light and magic. The fact that a non-directional, low-velocity fertilizer bomb parked 20 to 30 feet from a modern, steel-reinforced super-structure could not have caused the pattern and degree of damage it did is not being widely touted by the government or the mainstream press. The government expects the public to believe that two disgruntled amateurs blew up the Oklahoma City Federal Building with a homemade fertilizer bomb. Here is a report on the WTC tower collapses from Christopher Bollyn of American Free Press. However, it turns out that the seismic evidence seems to be based on a circular argument: the exact time of the collapse is established by an estimate from the seismic event itself, rather than any independent source of information such as a video recording of the event. From an energy analysis standpoint, the "pools of molten steel" are very hard to account for.